From the age of 5, it is drummed into us that we have to choose a career. By the time we are 13, we have an idea of what we are good at and what we would like to do (having learned that being a prince or princess is not an option! ), but by 14, we have to make a vague decision when we choose our subjects for GCSEs. Then at 16, we have to narrow this down further upon choosing A levels. When we have finished, there is the biggest decision: Job or Further Education. For those who choose a job, it is easier to make a career change in later life, but when we choose to undertake a degree, our options can in fact become limited. You may have found yourself in what you thought to be a dream career, but in fact it has actually turned out to be pretty dull. Fancying a career change? Pick a career that you like the sound of. Research it, and see if you think it is viable as a career for you. Will it fulfil your needs and interests? What qualifications do you need? Can you be bothered to go through all the coursework and stress? Be realistic, but don’t lose your ambition. 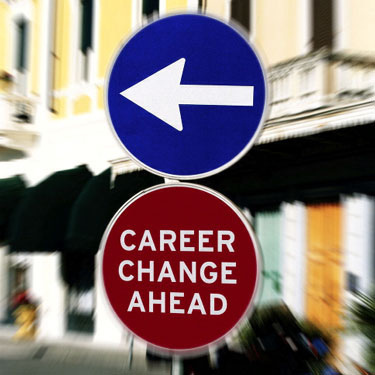 By even considering a career change, you are in the right frame of mind. After all, a career change will not come to you. You have to work hard for it. If you have any doubts about the strain on your time or whether you can fit retraining into your lifestyle, you have to make the time and space for it before you go any further. For those of us with an already busy lifestyle, you have to prepare yourself mentally for a bit of a struggle. Late nights studying, exams and classes can be hard to get back into but with the right mentality and a strong level of motivation, you will succeed. Is there financial support available while you work towards these qualifications? Will you have to take a salary cut when you start your new job? How long will the salary cut last? When running a home and supporting a family, you have to be realistic about money. If need be, study over a longer period to allow you to spread the cost over that period. If you aren’t totally sure of your new career move, why not try a taster course or enquire about voluntary work? A taster course will give you an idea of what you will be studying as well as the intensity of the qualification. Voluntary work, on the other hand, will give you a true feel of what the job would involve. Shadowing someone who is what you want to be can be very insightful and may even give you some experience or contacts to help you along with your career change. Some qualifications can be converted easily using a conversion course. One of the most popular conversions is the teacher-training qualification. Instead of just knowing your degree content, you can instead teach it, whether it’s to school-age children, adults, or as a private tutor. Other courses can help you to use your degree in different ways, for example, you can add a management course and choose the management track rather than performing the technical side of your role. If you aren’t quite ready to jump into a career change with both feet, whether limited by finance or other issues, why not do a bit of freelance work? You can keep up the day job, and do your freelancing at weekends, on days off, or during the evening. Getting established as a reputable freelancer can take a little time, but once you get started, you might just find a steady stream of work, depending on what you do. Writing is a great place to start, as most of us can write about something. If you enjoy web design, there could be work out there for you too! There are often jobs posted on sites such RentACoder or PeoplePerHour requiring people from all different skillsets, even including the weird and wonderful. Have a look online to see what you can find and start proposing. If you truly want to change everything and start over, go for it! The world is your oyster, and you control your future by the decisions you make. There are hundreds and thousands of options and opportunities out there, so take some time to work out what you want to do, who you want to be, and how you will get there. Once you are sure, take the leap and change your career. As you can see, there are many pros and cons to changing your career, but if you are unhappy doing what you do, you need to consider whether you will ever get past that. Someone once said: “If you do the job you love, you’ll never have to do a day’s work in your life”. By changing your career, you could be taking the steps towards living the dream. The thing that jumps out at me here is the "can you afford it" question, because this is something that not everybody bothers to think about. You need to be sure that you can afford to live for at least a short time in between jobs, as you don’t want to find that you have no job and no savings at all.